Did you know that San Secondo Spalla Cotta is the oldest typical specialty of the Parma area? 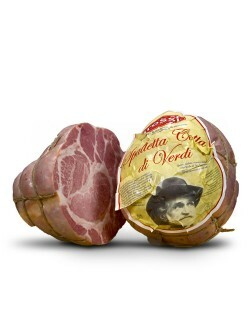 Giuseppe Verdi was particularly partial to it and enjoyed explaining to his friends different ways of savoring it. Spalla Cotta is delicious both hot and cold. If you fancy trying it hot, thickly slice it and serve with a good glass of Fortana wine and a few slices of warm bread or torta fritta- a typical Parma specialty made from water, flour, salt and baking powder which is molded into a dough, cut into pieces and fried in lard. Spalla Cotta is made from the pig's shoulder cooked in hot water, wine and laurel. In order to savor its full sweetness, the cold cut should be allowed to dissolve slowly in the mouth. Can you resists its softness?